We are well into the dog days of summer. The heat. The humidity. The desire just to lounge around drinking ice cold cocktails all day. 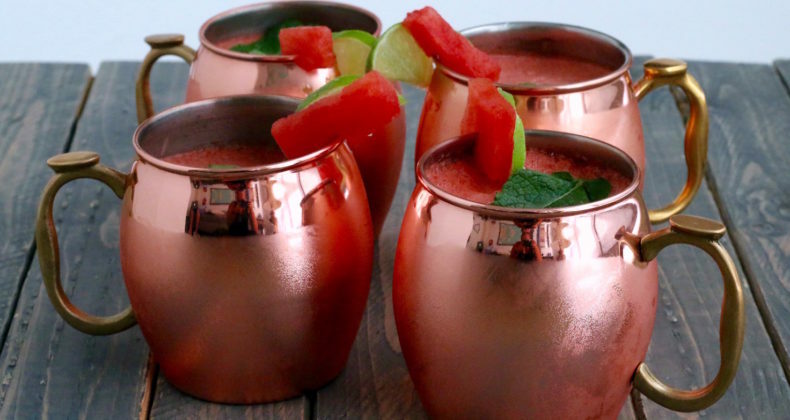 Or maybe that is just me 🙂 Watermelon Moscow Mules are the perfect way to cool off during those unbearably hot summer days. Using frozen cubed watermelon and serving them in the iconic copper cups ensures your drink will be frosty. This is coming at you just in time for the weekend and to celebrate National Watermelon Day on August 3. Watermelon is a well-loved summer fruit -naturally hydrating and cooling in and of itself. There is a little prep work involved with this cocktail. The watermelon must be frozen or at the minimum slightly frozen before you blend it together. Cut the watermelon into 1-2 inch cubes, pop in the freezer for at least four hours to firm up or overnight for a good solid freeze. Skip on the vodka to keep this alcohol-free -children, pregnant women, and those that don’t drink will be so happy with the mocktail version. When you head to the store make sure to check the produce aisle for fresh herbs. You need that fresh mint to make it a mule. What are you waiting for? Get that watermelon in the freezer STAT! Please drink responsibly these don’t taste like there is alcohol in them and on a hot day can go down quickly. What is your favorite way to enjoy Moscow Mules? This sounds SO good. I love the occasional Moscow Mule but sometimes the taste is a bit much for me–adding watermelon would be a brilliant way to mellow that out! Definitely going to give this a try! I am gonna buy me a big old watermelon at the next BBQ we host and I am going to make these. Slurp….. I hope you enjoy Bintu! Yum! 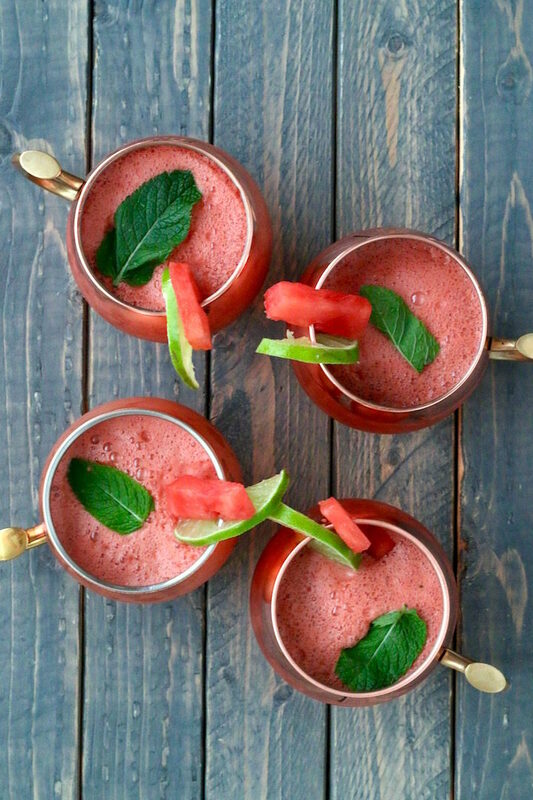 I’m all about watermelon right now, but I haven’t tried it in moscow mules. NEED to try this ASAP! Thanks for sharing! Watermelon is great and it is even better in a cocktail. 😉 Enjoy! These look amazing! Heading to the store now to get watermelon and mint…I already have vodka in the freezer! I like the way you are prepared, Lisa. 🙂 Cheers! This sounds so refreshing…I love the addition of the watermelon..perfect for summer! Cheers! Thank you, Catherine! They truly hit the spot on a hot summer evening. What a refreshing cocktail! I love the color and it is so perfect for summer. You are right, Tara, so perfect for summer! Enjoy. I’m thinking my house full of girls will love this…well minus the beer and vodka for my 3 year old…maybe add a sprite/gingerale? Yes, let’s keep the vodka away from the three year old 🙂 Ginger beer is considered nonalcoholic but gingerale, Sprite, or even a lime flavored sparkling water would be perfect substitutes.